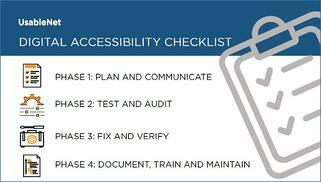 Our 4-phase checklist (1 page per phase) maps out all of the steps and best practices for effectively planning your web accessibility initiative. Before making an investment, it's important to know all of your options and to have a detailed plan for achieving and maintaining compliance. Download our comprehensive and actionable checklist and reference it throughout your initiative to know exactly how to approach accessibility for your digital channels.